Eek! I have managed to miss my actual blogiversary again. On July 8, 2008 I started this little blog, planning to keep it going for about half this time, maybe three or four years. But then I became a part of one of the brightest, most supportive communities out there. Now when I think about quitting, I feel preemptively sad about missing out on my favorite community events and I worry about losing the connections I've forged with some of my favorite people on Earth. When I started this blog, it was a month before the Beijing Olympics and we were still four months away from electing President Obama to his first term. I had a four year old kid and I was looking for people to talk to about something other than parenting. I had finally found the time to start reading again after Z started preschool a year earlier and I felt confident that I could contribute something to the (then fairly small) book blogging world. Little did I know how much blogging would become a part of my life. I read as much as I want now because I can justify it by writing a blog post afterward. 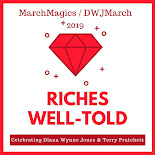 I host DWJ March/March Magics annually to celebrate two beloved authors and it is the highlight of my year. Close on its heels in my heart are the annual R.I.P. event and the two 24-Hour Readathons. I base my reading year off of them, tucking aside books that I think would be perfect to give me the creeps or to keep me awake at 2 am. But most of all it's the people. I chat with many of you on Twitter regularly and follow your lives on Instagram. I even get to meet some of you in the physical world and it's always a treat! I have yet to be disappointed by a single one of you and am happy to call many of you friends. Anyway, thank you for supporting me for eight years, for commenting and participating and suggesting books. I couldn't have done it without you. Aw, that's very kind of you, Jean! Thank you! Cheers to another great year, Kristen! HUGS and happy blogging birthday to you, my lovely friend! I'm so glad you've stuck around longer than your original plan, cause I always love chatting with you about books and mutually fangirling over Diana Wynne Jones! Aw, I couldn't imagine giving that up. Thank you, Jenny!